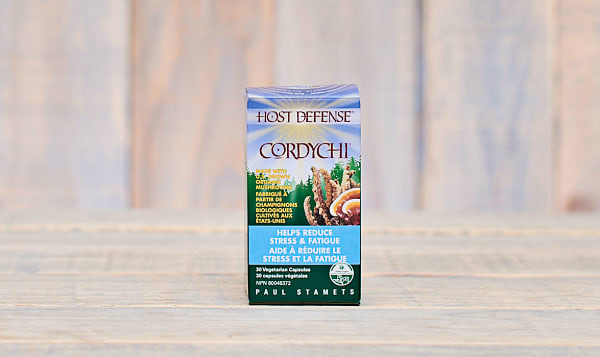 Host Defense® CordyChi® Capsules use activated, freeze-dried, Certified Organic mycelium, with a full spectrum of constituents: polysaccharides (beta glucans, arabinoxylane, glucose, xylose, galactose and cordycepic acid), glycoproteins, ergosterols, triterpenoids and other myco-nutrients, which are essential for Supporting Natural Immunity. This product traveled 325 km to reach our warehouse. Host Defense Organic Mushrooms is a family-owned, environmentally-friendly company specializing in functional food mushrooms to improve the health of the planet and its people. Founded by mycologist and author Paul Stamets, Host Defense is a leader of new technologies harnessing the inherent power of mushrooms and fungal mycelium worldwide.